The reader will be aware that generally it is the chassis/engine manufacture that governs the brand (identity) of a bus. E.g. it is an AEC RT not a Park Royal (or Weymann) RT etc.. However in the case of this particular RT (RT190) the body has determined the identity of the RT and not the chassis or engine! 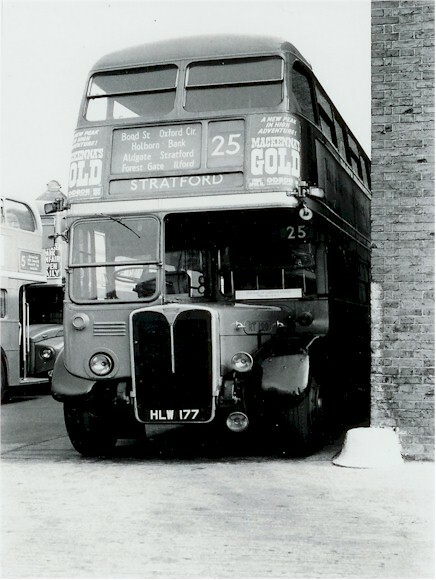 RT190 (HLW 177) was part of the first batch of RT3s bodied by Park Royal (body number 1439) and taken into stock by London Transport on October 3rd 1947. It was delivered to Leyton Garage primarily to replace the open staircase LT type 6-wheeler buses that mainly operated on the 10, 35 and 38 routes radiating out into the Essex countryside (principally Epping Forest). On May 13th 1949, RT1173 (JXC 481) with a Saunders Engineering Shipyard Ltd. (of Beaumaris, Angelsey) body (numbered 2452) was also taken into stock by LT and delivered to Elmers End Garage. RT1173 (JXC 481) out of Rye Lane Garage pictured outside Peckham Bus Garage. ©unknown; kindly supplied by Chris Stanley. In the meantime, the older RT190 (HLW 177) with its then newer Park Royal body [see Note 2] (LT number 4875), acting for sometime as a driver trainer vehicle, lasted at West Ham Garage until being withdrawn in October 1969 to be onward sold in January 1970 to S. Eynon, Trimsaran, Carmarthenshire. The RT190 (HLW 177) with its Park Royal body L1035 (LT fleet number 4875). Since it was impractical to preserve RT1173 in an “as delivered” condition [see Note 1] it was decided to re-register RT1173 with the older, and since scrapped, RT190 registration HLW 177 and preserve the features of the earlier RT3 body. Thus PRV body (number 1439) was “reunited” with RT190 (JXC 481) albeit on a later 1949 chassis. Here is RT190 (registered as JXC 481) with its PRV body (number 1439) pictured in 1974 at the Southend Rally by ©Michael Clarke, and kindly sent in by Chris Stanley. The RT3 (HLW 177) with its PRV 1439 body. And pictured here at Green Park on October 28th '06, the last day of Routemasters and Crew Operation on Route 38, the same route on which RT 190 began in the Autumn of 1947.
the reapplication of LPTB legal lettering LTE being the owning authority from January 1st 1948 (only 200 RTs had ever received this). and the pre-war “STL-type” headlamps that were still extant on RT1173 were kept as they were also fitted to the very first post war RTs (presumably to use up pre-war stock). [Note 1] The RT3 bodies differed from all other post war RT bodies in that they could not be inter-mixed with Leyland (RTL) chassis. The Leyland RTL chassis had larger dumbirons which were not compatible with RT3 bodies. Later bodies could be fixed to either AEC (RT) or Leyland (RTL) chassis. This page by Dean Jones. [Note 2] Previously this text indicated that the older RT190 (HLW 177) had a Saunders body. Brian Watkinson has advised that RT190 never had a Saunders body, it always had a PRV body albeit of different styles. [Note 3] The text here indicates that this is not an exhaustive list however Brian Watkinson points out that originally RT190 would have had green marble effect rubber sheet on the front bulkhead (rexine was never used at this location) and coving panels. Upon overhaul, this would have been replaced by khaki linoleum or painted over.